First, thank you so very much for all of your holiday orders! Our inventory was pretty much depleted, which is wonderful because that means I get to work on new card creations. 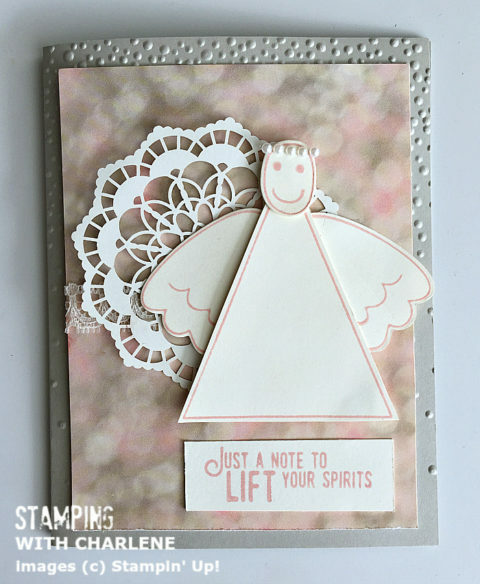 One of my newest favorites for our upcoming subscription box greeting cards is this adorable angel card. Not only do I love the angel, but I love the sentiment, too! “Just a Note to Lift Your Spirits” can be used for a variety of occasions from sympathy to get well to thinking of you. I’m going to be adding a new feature to my blog posts this year. I’ll be sharing the details of the cards I make so that you can make them, too. I’ll feature a list of the supplies I used to create each card with a link to the tutorial and to the products that I used. Let’s get started with today’s angel card! 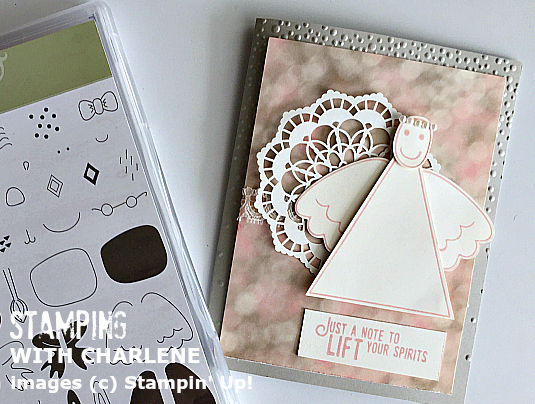 For details about the creation, visit my stampinwithcharlene.com blog. Below is a slide show of the items I used to create the card. To purchase a supply item, just click the image in the slide show. The link will take you to my secure online papercrafting supply store. If you aren’t up to the task of DIY’ing your cards, click HERE to place an order. Just specify “angel card” in the shipping instructions and I’ll know to include this card in your order.